If you're looking for classic blueberry recipes or perhaps a timeless blueberry cookbook, look no further. 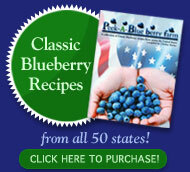 Welcome to the official website of Peek-A-Blue Berry Farms of Upstate New York, home of the original 50-States Blueberry Cookbook, a compilation of several hundred blueberry recipes from all 50 states and several countries. Started in 1999, the Keeler family planted over 1,000 blueberry plants, mostly of the Highbush variety. Now, their passion for blueberries has been shared with the world through an amazing blueberry cookbook with an even more amazing story! At age 12, Chelsey Keeler asked readers of Country Magazine to mail her their favorite blueberry recipes and memories. After receiving over 2,500 blueberry recipes and 1,000 letters, Chelsey Keeler has put together a blueberry recipe book compiling blueberry recipes from across the country. Read more about how the blueberry cookbook came to life! 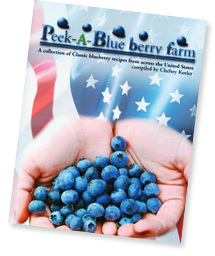 "Peek-A-Blue Berry Farm: A Collection of Classic Blueberry Recipes from Across the United States" is now available for purchase through this website! Take some time to read through a few sample blueberry recipes and get to know the story behind the book. Also, read about all of the health benefits and the nutritional facts of blueberries! 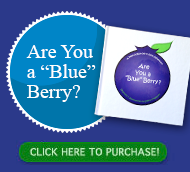 PROMOTING HEALTHY FOOD "FRUIT" CHOICES: "Are you a Blue berry"? Add this book to your child's "Blueberry" book library. Snuggle up with this book that promotes healthy food choices, and try not to giggle too much!